Close up view of a sample of SCP-750 outside its case. Special Containment Procedures: SCP-750 presents no threat unless applied directly to a human eye, and so shall be kept in Dr. Langley's office until all relevant tests and studies are completed. All instances of SCP-750 are to be removed from the previous user after testing has been completed, whereafter they are to be cleaned and returned to their included case. 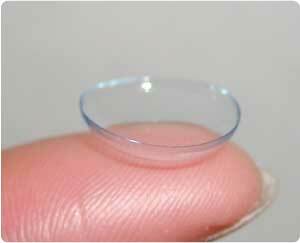 Description: SCP-750 is a group of twenty-four (24) contact lenses, designed presumably to correct myopic or hypermetropic vision. When a pair of SCP-750 is applied, they attach to the cornea and become unable to be removed physically by the wearer, though others can still remove them. Users of SCP-750 report an immediate blurring of their vision after application, followed by a period of extreme dizziness. When the user recovers from this daze, they describe a change in perception; this change seems to worsen with time, and prolonged exposure to the object will cause a wearer to permanently suffer the noted effects of SCP-750 even when the item has been removed from the cornea, in addition to affecting the wearer's sense of touch, smell, hearing, and taste. The only method of treatment at this point is to sever the optical nerve of the affected eye(s). Dr. ███████, as depicted by a subject exposed to SCP-750 for several hours. In addition, those affected will react with violent revulsion to other human beings, as well as ignoring any attempt to engage in interpersonal conversation or communication. Prolonged exposure to SCP-750 can and has resulted in schizophrenia, PTSD, dissociative identity disorder, and antisocial personality disorder. Addendum: SCP-750 was discovered by Dr. ███████, after he ordered a pair of 'X-ray specs' from a back page ad in Issue #█ of █████ █████ Magazine, and instead received a case containing SCP-750. The case also contained a page of 'instructions', which are transcribed below. Hey true believers! Thank you for ordering your new AMAZING see through specs, fresh from your friends here at THE FACTORY! Included within is your purchase, a life-time guarantee*, and a phone number to contact us should your friends get jealous and want the same power you've got now! Wondering exactly how your new eyes work? Simple! Just take one of the included lenses and get 'em reeeeaaaaal good and close to your old peepers. Your new purchase will take over from there! Have fun!!! *WOW! : Amaze your friends with new ability to see through their lies! *ZIPPIE! : Show off at school! No teacher can hide anything from you anymore! *AMAZING! : Discover secrets! Find hidden treasure! Know the unknowable! Anything is possible for you now! *Refunds not guaranteed. WARNING: Gazing directly at the truth may cause you to reconsider your miserable existence. Use with caution. Note: The phone number and guarantee mentioned above were not included in Dr. ███████'s ordered case.